The Marvelous Mrs. Maisel is an American period comedy-drama web television series, created by Amy Sherman-Palladino, that premiered on March 17, 2017, on Prime Video. The series stars Rachel Brosnahan as the eponymous Miriam "Midge" Maisel, a housewife in 1958 New York City who discovers she has a knack for stand-up comedy. Following the premiere of the pilot episode to critical acclaim, the series was picked up by Amazon for a two-season order on April 10, 2017. The first season was released on November 29, 2017, to positive reviews. The series won three Golden Globe Awards (Best Television Series – Musical or Comedy and two Best Actress – Musical or Comedy for Brosnahan) and five Primetime Emmy Awards, including Outstanding Comedy Series and Outstanding Lead Actress in a Comedy Series for Brosnahan. The second season was released on December 5, 2018. The series has been renewed for a third season consisting of eight episodes to premiere in 2019. Matilda Szydagis as Zelda, the Weissmans’ maid. Zachary Levi as Dr. Benjamin Ettenberg, a doctor whom Midge meets in the Catskills and later begins to date. On May 20, 2018, it was announced that Amazon had renewed the series for a third season which will consist of eight episodes. On October 24, 2018, it was announced that the second season would premiere on December 5, 2018. On April 15, 2019, it was announced that Sterling K. Brown will appear in the third season in an unknown role. ^ Starkey, Adam (November 29, 2017). "Rachel Brosnahan on how 'trailblazer' Joan Rivers inspired Marvelous Mrs Maisel". Metro. Retrieved December 12, 2017. ^ Soloski, Alexis (November 21, 2017). "Did You Hear the One About the Housewife Who Walks Into a Comedy Club?". The New York Times. Retrieved December 12, 2017. ^ Busis, Hillary (March 16, 2017). "Gilmore Girls Creator Amy Sherman-Palladino Explains her Marvelous New TV Series". Vanity Fair. Retrieved June 29, 2018. ^ Andreeva, Nellie; Jaafar, Ali (June 6, 2016). "Amazon Orders 5 Pilots from Guillermo del Toro, Amy Sherman-Palladino & Others". Deadline Hollywood. Retrieved July 12, 2018. ^ Andreeva, Nellie (March 2, 2017). "Amazon Spring 2017 Pilot Season Set: 5 Pilots, Including Amy Sherman-Palladino's 'Marvelous Mrs. Maisel' & 'Master Legend'". Deadline Hollywood. Retrieved July 12, 2018. ^ a b Andreeva, Nellie (April 10, 2017). "Amy Sherman-Palladino's 'Mrs. Maisel' Gets 2-Season Series Order At Amazon". Deadline Hollywood. Retrieved July 12, 2018. ^ a b Petski, Denise (October 10, 2017). "'The Marvelous Mrs. Maisel' Gets Fall Premiere Date & Trailer". Deadline Hollywood. Retrieved July 12, 2018. ^ Littleton, Cynthia (May 20, 2018). "'The Marvelous Mrs. Maisel' Renewed for Season 3 by Amazon (EXCLUSIVE)". Variety. Retrieved July 12, 2018. ^ Ausiello, Michael (April 8, 2019). "The Marvelous Mrs. Maisel's Season 3 Episode Count Finally Revealed". TVLine. Retrieved April 8, 2019. ^ a b Turchiano, Danielle (October 24, 2018). "Amazon Announces 'The Marvelous Mrs. Maisel' Season 2 Premiere Date (Watch)". Variety. Retrieved October 24, 2018. ^ Andreeva, Nellie (August 5, 2016). "Rachel Brosnahan Cast As the Lead In Amy Sherman-Palladino's Amazon Pilot". Deadline Hollywood. Retrieved July 12, 2018. ^ Petski, Denise (September 13, 2016). "Tony Shalhoub Cast In 'The Marvelous Mrs. Maisel' Amazon Pilot". Deadline Hollywood. Retrieved July 12, 2018. ^ Petski, Denise (September 19, 2016). "Michael Zegen Cast In 'The Marvelous Mrs. Maisel' Amazon Pilot". Deadline Hollywood. Retrieved July 12, 2018. ^ Andreeva, Nellie (October 6, 2016). "'The Marvelous Mrs. Maisel': Marin Hinkle Joins Amy Sherman-Palladino Pilot". Deadline Hollywood. Retrieved July 12, 2018. ^ Petski, Denise (May 4, 2017). "'The Marvelous Mrs. Maisel': Joel Johnstone & Caroline Aaron Set To Recur". Deadline Hollywood. Retrieved July 12, 2018. ^ Petski, Denise (May 9, 2017). "'The Marvelous Mrs. Maisel': Kevin Pollak & Bailey De Young Set To Recur". Deadline Hollywood. Retrieved July 12, 2018. ^ Goldberg, Lesley (May 23, 2018). "'Marvelous Mrs. Maisel' Recruits Zachary Levi for Season 2 (Exclusive)". The Hollywood Reporter. Retrieved July 12, 2018. ^ Andreeva, Nellie; Petski, Denise (August 15, 2018). "Jane Lynch To Reprise Emmy-Nominated Role On 'The Marvelous Mrs. Maisel'". Deadline Hollywood. Retrieved August 15, 2018. ^ Ausiello, Michael (April 15, 2019). "This Is Us' Sterling K. Brown Joins Marvelous Mrs. Maisel Season 3". TVLine. Retrieved April 15, 2019. ^ Mink, Casey (September 9, 2016). "Now Casting: Amazon Pilot 'The Marvelous Mrs. Maisel' and More". Backstage. Retrieved July 12, 2018. ^ "Filming at Physical Graffiti building angers residents". Page Six. September 30, 2016. Retrieved July 12, 2018. ^ Zuckerman, Esther (November 28, 2017). "Corsets and Comedy: Inside Amazon's The Marvelous Mrs. Maisel". Vanity Fair. Retrieved June 29, 2018. ^ Beery, Zoë (January 10, 2018). "That font you hate is coming back in style". The Outline. Retrieved July 12, 2018. ^ Patten, Dominic (August 9, 2018). "'The Marvelous Mrs. Maisel' Is Going To The Catskills In Season 2 Teaser". Deadline Hollywood. Retrieved August 9, 2018. ^ Pomranz, Mike (November 27, 2018). 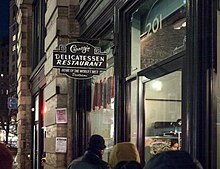 "New York's Iconic Carnegie Deli Returns as a Pop-Up Thanks to 'The Marvelous Mrs. Maisel'". Food & Wine. Retrieved January 11, 2019. ^ Cox, Lauren (November 27, 2017). "'The Marvelous Mrs. Maisel's Rachel Brosnahan: Midge Is An 'Upologetically Confident' Woman". Hollywood Life. Retrieved July 12, 2018. ^ "The Marvelous Mrs. Maisel: Season 1". Rotten Tomatoes. Fandango. Retrieved August 14, 2018. ^ "The Marvelous Mrs. Maisel: Season 1". Metacritic. Retrieved August 14, 2018. ^ Raeside, Julia (March 16, 2017). "The Marvellous Mrs Maisel: from the writer of Gilmore Girls, with brazen nods to Mad Men". The Guardian. Retrieved September 25, 2017. ^ Zuckerman, Esther (November 29, 2017). "Amy Sherman-Palladino's The Marvelous Mrs. Maisel pilot lives up to its title". The A.V. Club. Retrieved September 25, 2017. ^ Paskin, Willa (March 20, 2017). "Amid a Slew of Lackluster Amazon Pilots, Amy Sherman-Palladino's The Marvelous Mrs. Maisel Is a Knockout". Slate. Retrieved September 25, 2017. ^ Spiro, Amy (December 6, 2017). "The 'marvelous' Jewish story of Miriam Maisel". The Jerusalem Post. Retrieved December 7, 2017. ^ Powers, John (December 4, 2017). "Zippy And Delightful, 'The Marvelous Mrs. Maisel' Spotlights An Unlikely Comic". NPR. Retrieved December 7, 2017. ^ "The Marvelous Mrs. Maisel: Season 2". Rotten Tomatoes. Fandango. Retrieved December 25, 2018. ^ "The Marvelous Mrs. Maisel: Season 2". Metacritic. CBS Interactive. Retrieved December 25, 2018. ^ Plaugic, Lizzie (January 8, 2018). "Amazon's The Marvelous Mrs. Maisel wins the 2018 Golden Globe for best TV comedy". The Verge. Retrieved January 8, 2018. ^ Strause, Jackie (January 8, 2018). "Golden Globes: 'Marvelous Mrs. Maisel' Wins Best TV Comedy or Musical". The Hollywood Reporter. Retrieved January 8, 2018. ^ Russian, Ale (January 8, 2018). "Amazon's The Marvelous Mrs. Maisel Wins 2018 Golden Globe for Best Comedy Series". People. Retrieved January 8, 2018. ^ Piester, Lauren (January 8, 2018). "The Marvelous Mrs. Maisel Wins Golden Globe for Best TV Comedy But Is There Cheese Backstage?". E! News. Retrieved January 8, 2018. ^ Smith, Nigel (January 8, 2018). "First-Time Winner Rachel Brosnahan Pauses Globes Acceptance Speech for a Good Reason: 'Hi, Oprah!'". People. Retrieved January 8, 2018. ^ Plaugic, Lizzie (January 8, 2018). "Rachel Brosnahan wins 2018's Best Actress Golden Globe for Amazon's The Marvelous Mrs. Maisel". The Verge. Retrieved January 8, 2018. ^ Otterson, Joe (January 8, 2018). "'Mrs. Maisel' Star Rachel Brosnahan Advocates for More Women's Stories During Golden Globes Win". Variety. Retrieved January 8, 2018. ^ Perez, Lexy (January 8, 2018). "Golden Globes: Rachel Brosnahan Wins Best Actress for 'Marvelous Mrs. Maisel'". The Hollywood Reporter. Retrieved January 8, 2018. ^ Swift, Andy (December 6, 2017). "Critics' Choice Awards 2018: Netflix, FX's FEUD Lead TV Nominations". TVLine. Retrieved January 2, 2018. ^ Ramos, Dino-Ray; Bennett, A (January 21, 2018). "PGA Awards: 'The Shape Of Water' Wins Outstanding Producer; 'Handmaid's Tale', 'Mrs. Maisel' Tops In TV – Full Winners List". Deadline Hollywood. Retrieved January 4, 2019. ^ Nolfi, Joey (January 10, 2018). "I, Tonya, Get Out earn Costume Designers Guild nominations". Entertainment Weekly. Retrieved January 10, 2018. ^ "Peabody Awards: The Marvelous Mrs. Maisel". Peabody Awards. Retrieved April 20, 2018. ^ Moraes, Lisa de (August 5, 2018). "FX Russia Thriller 'The Americans' Takes TCA Trophies For Keri Russell, Best Drama And Program Of Year". Deadline Hollywood. Retrieved August 5, 2018. ^ Koblin, John (September 17, 2018). "2018 Emmys: 'Game of Thrones' and 'Marvelous Mrs. Maisel' Win Top Awards". The New York Times. Retrieved September 18, 2018. ^ a b Hipes, Patrick (July 12, 2018). "Emmy Nominations: 'Game Of Thrones' Tops Noms, With Netflix & HBO Leading Way". Deadline Hollywood. Retrieved July 12, 2018. ^ Lambe, Stacy (September 11, 2018). "2018 Creative Arts Emmy Awards: The Complete Winners List". Entertainment Tonight. Retrieved September 24, 2018. ^ Macke, Johnni (September 24, 2018). "2018 People's Choice Awards: Complete List of Finalists on People's Choice Awards". E! News. Retrieved November 15, 2018. ^ Pedersen, Erik (December 4, 2018). "AFI Awards 2018 TV: 'This Is Us' Is Lone Broadcast Show As FX Nabs Four Of 10 Slots". Deadline Hollywood. Retrieved December 4, 2018. ^ Snierson, Dan (January 6, 2019). "Golden Globes 2019: See the full winners list". Entertainment Weekly. Retrieved January 6, 2019. ^ Kilkenny, Katie (January 3, 2018). "Unsung Film of the Year – 'The Favourite,' 'Pose,' 'Killing Eve' Lead Dorian Award Nominations". The Hollywood Reporter. Retrieved January 9, 2018. ^ Kilday, Gregg (January 8, 2019). "Dorian Awards: 'The Favourite' Named Film of the Year". The Hollywood Reporter. Retrieved January 8, 2019. ^ McNary, Dave (January 20, 2019). "PGA Awards: 'Green Book' Wins Top Feature Film Award". Variety. Retrieved January 20, 2019. ^ Nordyke, Kimberly (January 31, 2019). "Casting Society of America's Artios Awards: 'Green Book,' 'Vice' Among Winners". The Hollywood Reporter. Retrieved February 1, 2019. ^ Giardina, Carolyn (February 2, 2019). "Art Directors Guild Awards: 'Favourite,' 'Black Panther,' 'Crazy Rich Asians' Among Winners". The Hollywood Reporter. Retrieved February 3, 2019. ^ Handel, Jonathan (February 2, 2019). "'Roma's' Alfonso Cuaron Takes Top Honor at DGA Awards". The Hollywood Reporter. Retrieved February 3, 2019. ^ Pedersen, Erik (January 7, 2019). "ASC Awards Nominations: 'Roma', 'A Star Is Born' & Others Make Cinematographers' Cut". Deadline Hollywood. Retrieved January 7, 2019. ^ Pedersen, Erik (January 8, 2019). "CAS Awards: 'Black Panther', 'A Star Is Born' & 'Mrs. Maisel' Among Cinema Audio Society Nominees". Deadline Hollywood. Retrieved January 8, 2019. ^ Pedersen, Erik (January 10, 2019). "Make-Up Artists & Hair Stylists Guild Applies Its Awards Nominations". Deadline Hollywood. Retrieved January 10, 2019. ^ Schwartz, Ryan; Gelman, Vlada (February 17, 2019). "Writers Guild Awards: The Americans, Mrs. Maisel and Barry Among Winners". TVLine. Retrieved February 18, 2019.